So is there a difference between winter fudge and summer fudge? Probably not, but when I saw sherbet flavored Oreos, I knew they had to go into something summery, and fudge seemed like a no brainer. I love going into fudge shops at the beach and seeing all sorts of flavors available, and since a little goes a long way, you can try a bunch of flavors. Or, just make your own! 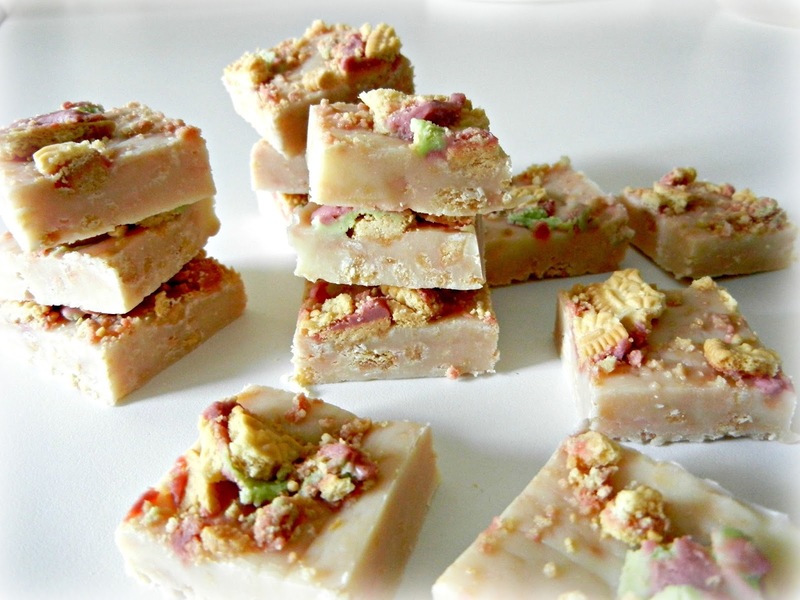 Squares of fudge always make me smile, but then I thought they could be dressed up a little more. 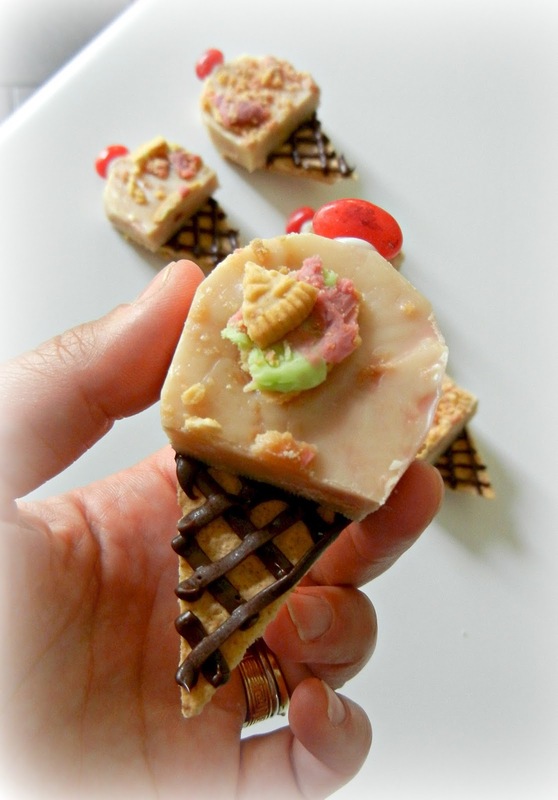 So you also get some fudge and graham cracker ice cream cones. I don't know which I like better! Microwave the chips and milk until just melted (it took less than 5 minutes). Mix, then add the crushed Oreos (save a little for the top). Pour into a 9X9 baking pan lined with foil. Then add more crushed Oreos on top. Let harden. To speed you can pop into the freezer or fridge. 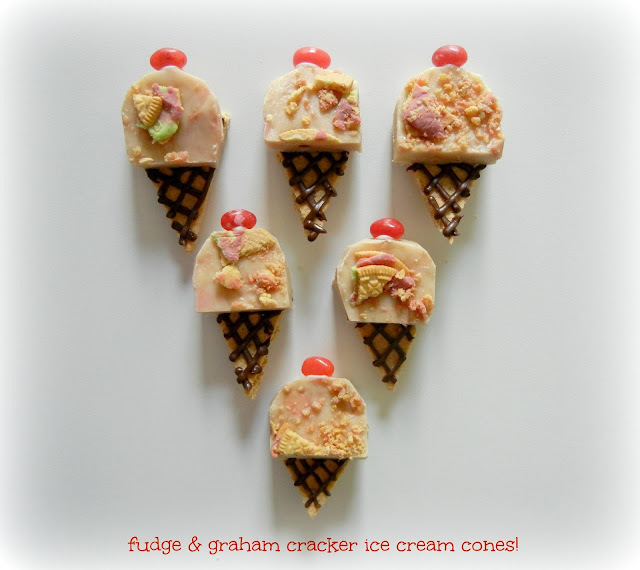 For the ice cream cones, cut triangle cone shapes out of graham crackers and ice cream mound shapes from the fudge. Use melted chocolate and pipe the lines onto the cone. While chocolate is still wet, add the fudge. Attach a "cherry" aka jelly bean to the top with more melted chocolate. And you get some cutie patootie ice cream cone fudge. What's your preference? Squares or Cones? This fudge is really sweet but isn't that what fudge is supposed to be? 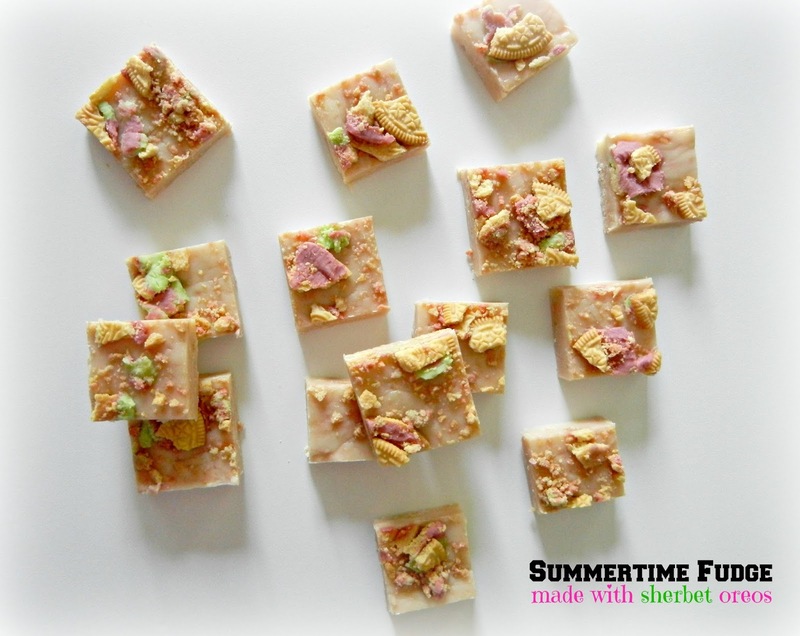 And if you freeze the fudge, you can have some summer fudge in winter! And as always, thanks for stopping by - only a couple more weeks of summer so enjoy it while you can! thanks Sue, they seem to have a new flavor every other day! 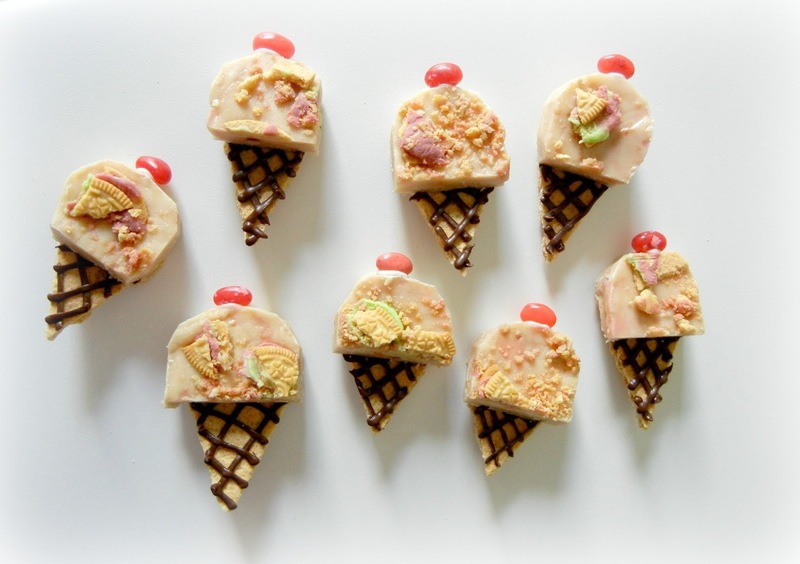 Oh my goodness, those little ice-cream cones are ADORABLE!!! What a cute idea!!! So fun for summertime! :) Very creative! Love the cones. Fun activity to make with my little Princess. I love how you made them into ice cream cones!